Innveso Consulting can help you to get citizenship in Dominica and take advantage of all of the opportunities that the citizenship presents. 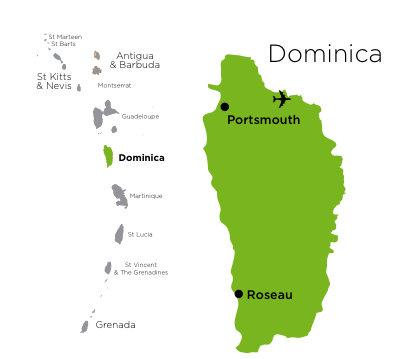 Dominica is an English speaking country that is often confused with the Spanish speaking Dominican Republic which it has no ties too. Dominica uses Eastern Caribbean Dollar which is tied to the US Dollar. It enjoys a strong economy and relatively no crime. This is an ideal location to live or to visit it as a citizen. We follow the rules that are set forth in the Section 101 of the Constitution and Sections 8 and 20 (1) of the Citizenship Act as set forth under Dominica law to help you secure your citizenship. Our consultants can help you to decide which citizenship by investment program will most closely fit your family. This is one of the easiest citizenship programs because the investment requirements are relatively small. It is an easy way to gain citizenship to a beautiful country that has liberal regulations. We can help you every step of the way. The entire process takes about 3 -4 months from the point of investment. This citizenship is impossible to obtain on your own without some expert support, because all the applications must be submitted through a Licensed Agent. We can make the rest happen. Once you call and speak to an agent and agree to the terms we will get right to work to get your paperwork started. Innveso Consulting can handle everything once you agree to the terms. We offer a complete menu of options that can be customized to meet your goals. Whether you plan on moving to Dominica or just obtaining your citizenship for use as you see fit we are here to offer our experienced services. We can help with every aspect of the process and you can utilize our full menu of services to reach your goals. Our business has been built on a client focused approach and full confidentiality. Contact an agent right now to learn more about the benefits of citizenship on this beautiful island paradise. Ask us about corporate opportunities in this region as well. Dominica offers excellent investment opportunities as a classical offshore jurisdiction.